The Giant Pencil by Connor Wilson. 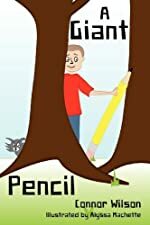 Review: Connor Wilson, a mere 9 years old, has demonstrated incredible talent in the publication of his first book, A Giant Pencil. As officially the youngest traditionally-published fiction writer, Wilson will undoubtedly reach the hearts of both young and old in his book. A Giant Pencil incorporates ideas from Harold and the Purple Crayon as he traces a day in the life of a typical boy. Billy is a grumpy boy. He, like many boys, feels as if the whole world it against him. He feels that his family does not want him, the kids at school do not want him around, his teacher is mad at him, and even the lunch lady doesn't like him. When Billy thinks he just can't stand it anymore, he finds a pencil - a giant pencil that falls from the sky that will change everything! But, is change always good? Billy quickly finds out. Absolutely charming is how readers will describe A Giant Pencil. People one day or another all feel like the world is filled with others who are against them, and this feeling of doom is particularly strong in children. Children everywhere have complained that someone doesn't like them, or that someone is ignoring them, or that someone is mad at them, and for a child that is devastating. Billy's journey with the giant pencil teaches children a powerful lesson about life, one that every child and adult alike need to remember. Connor Wilson has a bright future ahead of him. He has a knack for the written word and is someone who will undoubtedly connect with a younger audience. It is refreshing to have a book written for children from the viewpoint of a child. Because Wilson is living life as a child and writing for children, he most certainly will share a book that will appeal to the mind of a child. But what Wilson also did, is he wrote a book that will appeal to all readers. Well done, Connor! We would like to thank Maryglenn McCombs for providing a copy of The Giant Pencil for this review. Have you read The Giant Pencil? How would you rate it?